Outdoor Indian weddings have been one of the most growing trends in last couple of years here in Toronto. If you are looking for bright and airy beautiful light on your wedding day, outdoor wedding is for sure something you may consider. 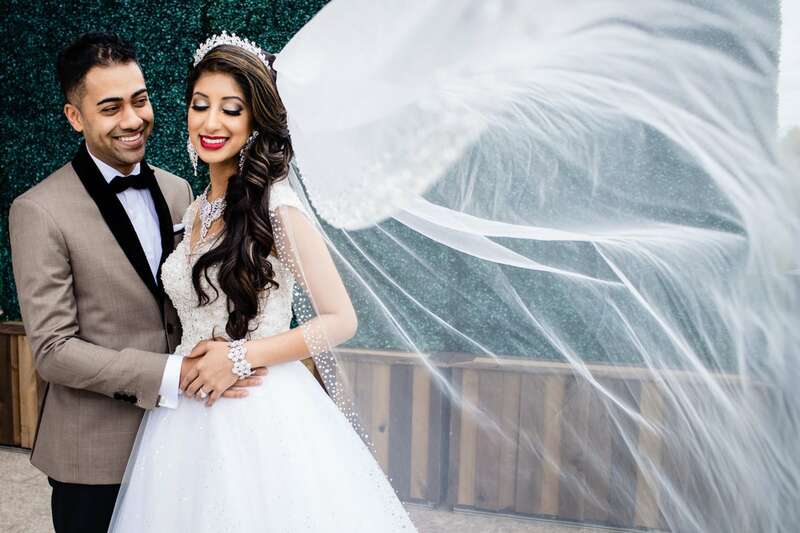 Living in Toronto or Mississauga, weather can be difficult to predict and we always tell our clients to ensure you have plan B at your outdoor Indian wedding venue in worst case the weather does not support us on the wedding day. Disclaimer : There are so many other venues which can host an outdoor Indian wedding which we have not yet worked with. Please check all your options and we hope to grow this blog every year with new venues. Here are some venues we can recommend from our experience of photographing outdoor weddings. This venue has one of the best facilities for outdoor weddings and ceremony. This spectacular park-like venue has gazebos perfect for your ceremonies, beautiful gardens, a waterfall and a natural lake. Not only you get options with two beautiful gazebos for outdoor ceremonies, you also have two beautiful ballrooms for indoor ceremonies in the worst case of bad weather. Sikh weddings normally take place in the terrace gazebo mainly because the gazebo is situated such that Guru Granth Sahib Ji is placed higher than guests whereas most Hindu weddings are done at the lakeside gazebo. Both these gazebos can host about 250 seats. Terrace gazebo has more shade and size of that gazebo is bit bigger than lakeside gazebo. In case of rain, there is always indoor space available for guests at the two beautiful indoor ballrooms which are right next to each other. The two major ballrooms at the property are Embassy which can accommodate about 500 people and Greenhouse which has about 320 capacity. Stunning views and neo-classical architecture create the perfect backdrop for your special day. The Embassy Ballroom features ceilings that soar to as high as 24’ and boast majestic windows and a spectacular terrace overlooking 55 acres of parkland with a fabulous view of the lake. Both the ballrooms and gazebos have separate parking areas so no worries if you are planning a full on baraat with a horse at this venue, space will be never be problem. The lush green grass, fountains and flowers add a natural fresh feel to the wedding imagery. The management allows outside catering so arranging for Indian cuisine for Sikh and Hindu weddings are usually not a problem. We highly suggest during hot summer days to have a space reserved for water for the guests during the ceremony and order paper umbrellas for Ali Baba to save your guests from direct sun exposure. One of the best things about photographing a wedding here is that couple can use the property to take their post-wedding photos and you don’t have to find another location to take your bridal party for pictures. This will save you a lot of time and hassle not having to drive elsewhere. Here are some images from this venue. History and heritage with a modern touch, Guild Inn is state of the art ballroom which can sit over 1000 people overlooking the beautiful Greek architecture. This beautiful venue gives you that freedom of shooting outdoors, a perfect post-wedding location for photography as well as a beautiful natural lit reception ballroom. Guild Inn is a beautiful location to plan your outdoor wedding. Venue does have beautiful terrace and gazebos which can be used for your outdoor Sikh or Hindu wedding ceremony. Indian weddings usually have a big guest list and this venue can fit about 300-400 people at the terrace for the Sikh or Hindu Indian wedding ceremony. Post-wedding pictures can be taken a the Greek Theater which compliments the regal outfits of Indian brides. Although, you are getting married at the property, you have to buy an additional permit to photograph your post-wedding images at the Greek Theater. Property also only lets you use HOST as their official Indian Wedding partner for catering. The terrace where usually all the Indian outdoor weddings take place is covered so you don’t have to worry about rain at your wedding ceremony. Terrace has a lot of natural light and you can have the ceremony face the East side if you wish to have the ceremony under the sky. Here are some of the images from a recent Hindu ceremony at Guild Inn Estate. Brand new state of the art facility for Indian weddings makes this our new favorite for outdoor weddings. A very clear edgy look to this heritage place is truly a luxurious experience. Venue can hold upto 500-600 people for your Indian wedding and outdoor barn wood alter is a perfect for mandap for Hindu wedding. Both East wing and West wing have their own cocktail terrace area which are perfect for outdoor mahiyas or sangeet. At our last Gujrati wedding, the bride and groom came on a helicopter and yes venue has a helipad if you wish to have this experience on your wedding day. This 7 acres property has almost everything you can ask for your Indian wedding needs including lots of lush green lawns and 1.5 acres pond which will be give a beautiful background for your post-wedding images. 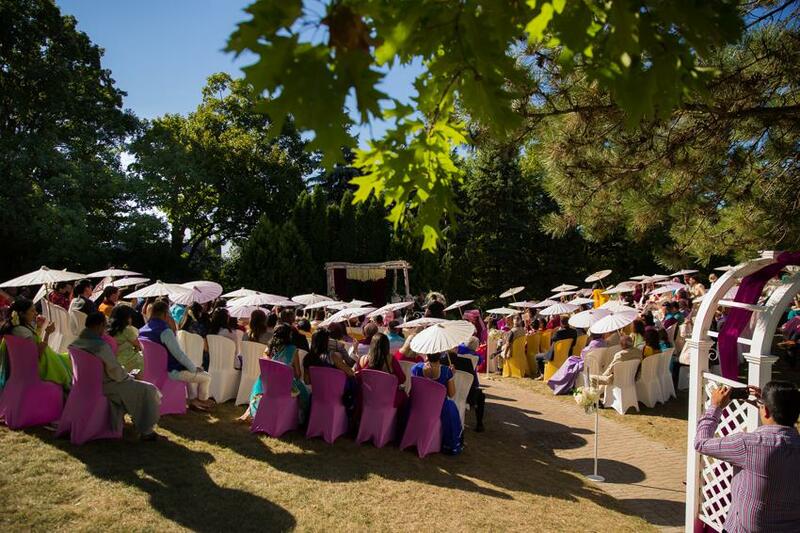 The Gardens of Ascott Parc are another great venue in the heart of Vaughan for your Indian Sikh or Hindu outdoor ceremony. Garden ceremony can be hosted in the garden gazebo which is one beautiful set perfect size to setup for outdoor Hindu or Sikh ceremonies. 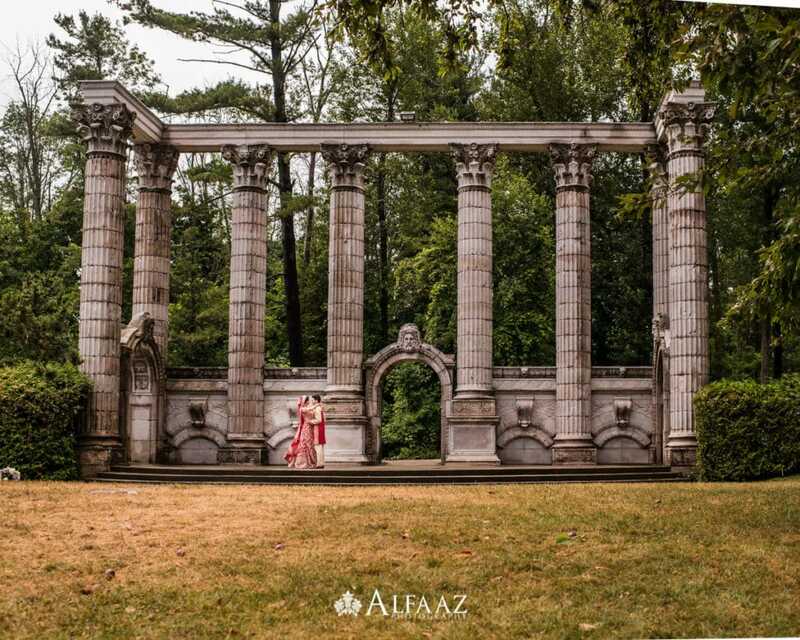 The background of the gazebo has fountains which can be used for beautiful post-wedding images. Windsor and Trillum are two major ballrooms at the property which are perfect for post-wedding dinner or for your grand Indian reception. 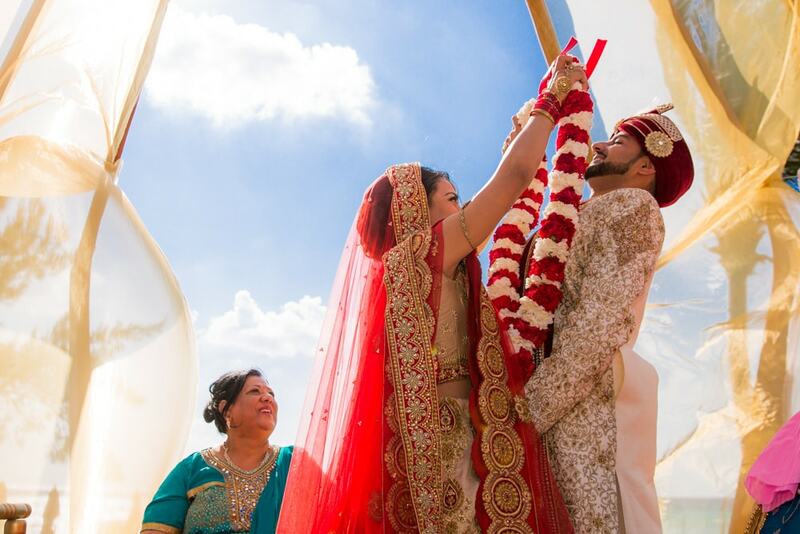 Here are some of the images from Hindu Wedding at this beautiful outdoor venue in Vaughan. One of the most extravagant golf clubs is open for outdoor Indian weddings. The venue has a special South Asian wedding package to meet the needs of your outdoor Sikh or Hindu wedding in Woodbridge, Toronto. The spectacular and expansive clubhouse, plus spacious outdoor patios, offer magnificent views of the property. With 62,000 square feet, the facility is elegant and large enough for any event. Even if you are planning an outdoor ceremony with over 400 people, this venue can serve your guests with ease. Their guaranteed service includes focusing all the attention on you and your guests. No bumping into other bridal parties or having to wait in line for the perfect photoshoot location, they even offer you couple of golf carts for post-wedding photoshoot. Here are some of the images from a Hindu wedding photographed at this property. Another place we highly recommend as well which can host Indian weddings is Palais Royale. 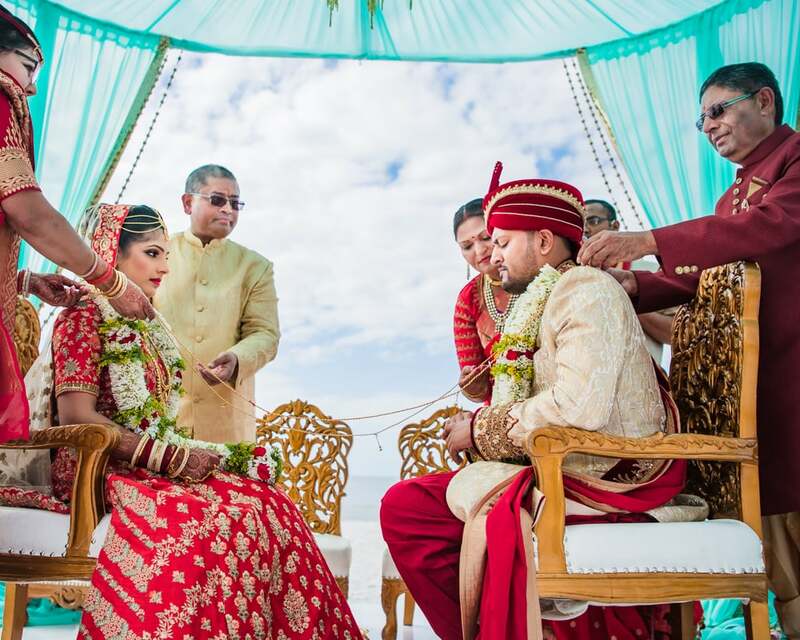 Many couples like to take advantage of the beautiful outdoor deck or stunning grand ballroom where you can set up your wedding mandap for your Hindu wedding. It is really a magical setting and they are willing to work with brides and grooms to meet their South Asian outdoor wedding needs. Situated in the heart of Toronto facing Lake Ontario, this venue has almost everything an Indian wedding bride desires. From a grand entrance to fancy ballrooms which can fit more than 600 guests. It also has a beautiful courtyard which can host your outdoor lavish Sikh or Hindu ceremony. 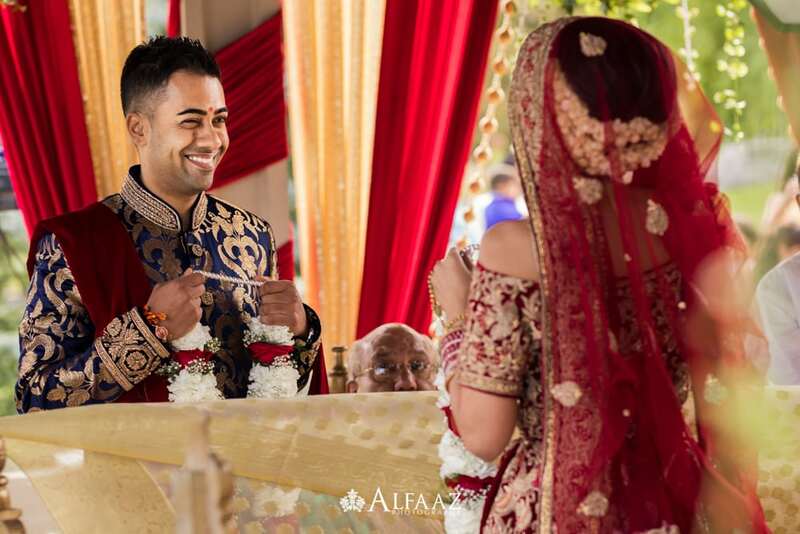 For more tips for your outdoor Indian wedding, please see https://alfaazphotography.com/landing_pages/outdoor-wedding-ceremonies/.